Samsung SyncMaster 940MW is a 16:10 wide format wide-screen 19-inch LCD computer monitor that utilizing Samsung’s proprietary MagicTuner technology and can be functioning both as a LCD monitor and LCD TV. 940MW is HDTV-ready and supports NTSC, PAL, SECAM TV broadcast and Virtual Dolby BBE Sound. 940MW also features a built-in FM tuner and Picture-in-Picture and Picture-by-Picture functionality that allows viewers to watch two video sources at the same time. 940MW has specifications of 700:1 contrast ratio; a brightness of 300 cd/m2; pixel pitch of 0.294mm; 1440 x 900 (WXGA+) native resolution; and a wide horizontal/vertical viewing angle of 160/160. Sci-Tech Today reviewed Samsung SyncMaster 940MW and gave the LCD monitor a rating of 4.5 out of 5, and concluded that SyncMaster 940MW has an impressive list of features that justifies the relatively steep price tag. More than just a computer monitor, the 940MW offers the ability to connect a TV signal and display it in HD. 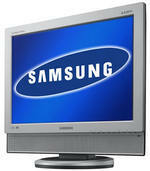 Samsung SyncMaster 940MW brings a new level of enjoyment to multimedia viewing. Being able to incorporate computing tasks, game playing, TV shows, and movies all at the same location is a joy. This convenience comes at a higher price than traditional widescreen LCDs, but for the multimedia aficionado, this monitor is well worth the investment. Pros: PC and Mac compatible; easy-to-use controls; built-in speakers; bright and sharp picture; 1,440 x 900 WXGA+ widescreen resolution. Cons: No DVI cable included; base is not adjustable.